Friday April 3- 1931 A rainy snowy day. I had letter from Winnie wrote Aunt Emma and Laura in AM. Mary took me for my treatment in the afternoon Came home by Bus. Got books at Library, read in evening. William better Saturday April 4- 1931 I gave the room a good cleaning. Cora brought Hattie and we went to Mrs [Rushs?] funeral.Then on up town. And to Ott's office He brought me home. My feet hurt terribly in afternoon I wrote Winnie. I read in the evening Sunday April 5- 1931 I felt able to go to church by wearing old shoes. 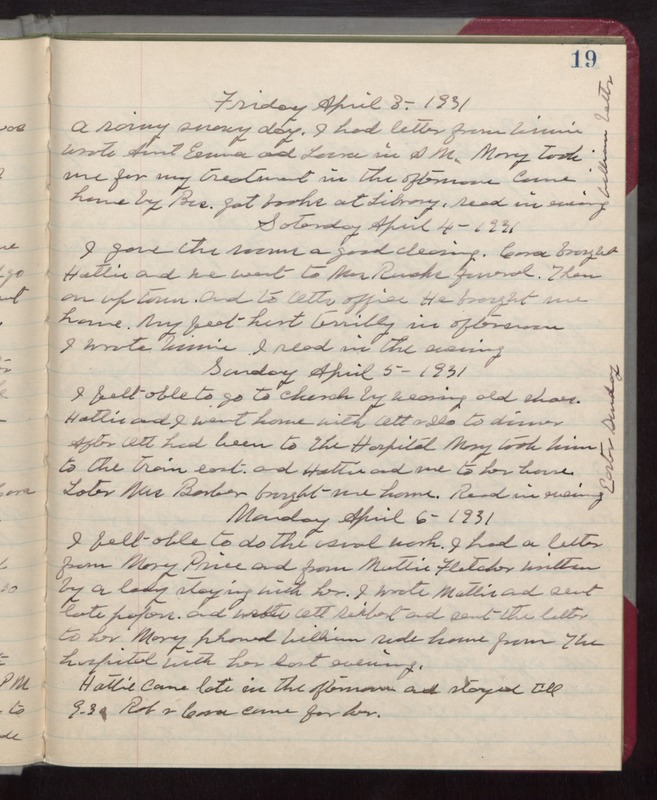 Hattie and I went home with Ott & [Ida] to dinner After Ott had been to The Hospital Mary took him to the train east. and Hattie and me to her house. Later Mrs Barber brought me home. Read in evening Easter Sunday Monday April 6- 1931 I felt able to do the usual work. I had a letter from Mary Price and from Mattie Fletcher written by a lady staying with her. I wrote Mattie and sent late papers. and wrote Ott Seibert and sent the letter to her Mary phoned William rode home from The hospital with her last evening. Hattie came late in the afternoon and stayed till 9.30 Rob & Cora came for her.